Polycystic ovarian syndrome (PCOS) is a complex endocrine disorder characterized by insulin resistance which in turn leads to elevated levels of androgens, anovulation, amenorrhea or oligomenorrhea, obesity and polycystic ovaries. Objectives: To evaluate efficacy of herbal formulations-Nishamalaki and Kanchanar Guggulu in animal model of PCOS. Material and Methods: Six female rats of Group I served as control (No Letrozole, no treatment), Letrozole was given 1mg/kg /day for 28 days to induce PCOS in remaining female wistar rats which were then divided into 6 groups of 6 animals each Group II- PCOS disease control, Group III – Clomiphene citrate, Group IV- Nishamalaki, Group V- Metformin, Group VI- Nishamalaki & Metformin and Group VII- Kanchanar Guggulu. Animals were treated orally according to groups for 56 days. Body weight, food intake, Insulin, blood glucose levels and lipid profile checked before and after treatment. Vaginal smear was done daily to study estrous changes. Results: Along with dyslipidaemia, Rats with PCOS showed increase in body weight and insulin levels. Significant reduction in body weight, lipid profile, Blood sugar and insulin was seen in Nishamalaki treated animals but not in Kanchanar Guggulu group. Kanchanar Guggulu and Nishamalaki regularized the cycles in 1st and 3rd weeks respectively. Conclusion: Nishamalaki effectively corrected all changes in PCOS whereas Kanchanar Guggulu only regularized the estrous cycles. Polycystic ovarian syndrome (PCOS) is the most common endocrinological abnormality affecting 4-10% of women in their reproductive years worldwide. PCOS is a complex disorder with the interplay of endocrine and metabolic factors. This condition is multifactorial though its exact pathophysiology remains uncertain. Since its description in 1935 by Stein and Leventhal, much has been learned about the pathophysiology of PCOS from its neuroendocrine involvement to the link between obesity, insulin resistance (IR) and PCOS. Typically, PCOS manifests as hyperandrogenemia, obesity, polycystic ovaries and chronic anovulation. Endocrine component constitutes disturbance in ovarian hormones with increase in LH, reduction in FSH and increase in androgens which gets amplified by hyperinsulinemia- the metabolic component. Hyperinsulinemia is more prominent in obese cases of PCOS. Obesity is commonly encountered in PCOS. Obesity leads to endothelial dysfunction and release of inflammatory markers. This in turn promotes insulin resistance and causes hyperinsulinemia. Insulin resistance (IR) is now recognized to be an integral feature of PCOS present in both lean and obese women influencing not only metabolic but endocrine and reproductive abnormalities of this syndrome. Recently, more evidence of sub-clinical hypothyroidism and autoimmune thyroid disease is reported in patients of PCOS in comparison to normal individuals though exact relationship between these conditions is yet to be established, increased BMI and insulin resistance is common in both these conditions. Insulin resistance and hyperinsulinemia, therefore, appear to be important contributors to PCOS. Exact terminology for PCOS is not available in Ayurveda but it can be considered as “Granthyārtava”. Granthyārtava is thought to be produced due to varied factors such as improper food habits, consumption of dry food and habitual constipation. This causes vitiation of Vāta dosha and subsequently Jatharagni also gets affected, leading to hormonal imbalance producing Grathita ārtava and Grathita Raja due to excessive deposition of pārthivāṃśa in ārtava and rajas and loss of āgneya and ākāśīya aṃśa. As ārtava and rajas lose their fluidity, ovulation and menstruation may not occur for months and lead to enlargement of ovaries. Absence of menstruation leads to deposition of waste material in the body which ultimately is responsible for symptoms such as weight gain, feeling of heaviness in the body, hirsutism etc. Treatment usually is initiated with lifestyle interventions such as dietary changes and exercise. Pharmacological therapies are used only when lifestyle modifications fail. Pharmacologic treatments may be required for hyperinsulinemia, hirsutism, menstrual irregularities and anovulation. Treatment strategy is based on three main pillars-first is the use of Insulin sensitizing agents which act by reducing insulin resistance- drugs from Biguanide group such as Metformin (Met) and/or Thiazolidinediones – such as Pioglitazone. Second group of drugs are used to improve ovulation and fertility – such as Clomiphene citrate. Antiandrogenic agents such as Cyproterone acetate, OC pills & Spironolactone form the third group of drugs used to reduce acne & hirsutism. Metformin has adverse effects such as nausea, metallic taste, bloating etc., which limit the long-term use of this agent. Niśāmalakī (NA), a combination of Curcuma longa (CL) and Emblica officinalis (EO) in a proportion of 1:1 is used clinically to treat diabetes mellitus. In our previous animal study it was observed that Niśāmalakī (Curcuma longa 1:3 Emblica officinalis) when used along with STZ, delayed the development of diabetes. This action is referred to as prophylactic action, indicating the efficacy of NA in pre-diabetic state. In pre-diabetic individuals, most commonly, insulin resistance is present. Curcuma of NA is known to have PPARγ activity, which is useful in reducing insulin resistance. Additionally, it is not reported to have adverse reactions. It was therefore hypothesized that NA would be effective in PCOS. Kañcanāra Guggulu (KG), contains 11 different plants. The main content of KG is Kañcanāra. KG corrects the pathophysiology of PCOS with Pācana, Lekhana and Dīpana actions. KG has kaṭu madhura rasa, uṣṇa vīrya and kaṭu vipāka and helps in māṃsa and medo dhātu lekhana and thus helps in reducing the size and arrests further growth of multiple cysts in the ovaries. Thus itis used clinically for treating PCOS by Ayurvedic Prasūti and Strīroga specialists to improve ovulation. Clomiphene citrate is from biomedicine used as standard comparator. Ayurvedic Medicines are attractive therapeutic alternatives due to their efficacy and lesser ADRs. In the present study, NA was tested as an alternative to Metformin and Kañcanāra Guggulu as an alternative to Clomiphene citrate. Since the mechanism of action of NA is partly known and is different from Metformin, addition of NA and Metformin was also evaluated. The action of Kañcanāra Guggulu in terms of modern understanding of pathophysiology and pharmacology of PCOS is not known. So, Clomiphene citrate and Kañcanāra Guggulu were evaluated separately but not in combination. After obtaining IAEC clearance, study was started with the preparation of NA which is a combination of Curcuma longa and Emblica officinalis (1:3) The formulation was prepared under the guidance of ayurvedic experts as per the ancient Ayurveda references in the laboratory of Ayurveda college of Bharati Vidyapeeth and the standards complied compared with those given in Ayurveda Pharmacopoeia of India. Kañcanāra gugguluwas purchased from the ayurvedic shop with batch no. 130822 Jan 2014 and Expiry date Nov 2018 from Ayurveda Ras-shala, Pune and the same was used for the complete study. Kañcanāra gugguluformulation contains Bauhinia variegata L. (Bark), Terminalia chebula Retz (Fruit rind), Terminalia bellerica (Fruit rind), Emblica officinalis (Fruit), Zingiber officinale (Rhizome), Piper nigrum (Fruit), Piper longum Linn (Fruit), Crataeva nurvala (bark), Elettaria cardamomum (Fruit), Cinnamomum zeylanicum (Leaves and Bark), Commiphora mukul (Guggulu Resin). The study was conducted in accordance to CPCSEA guidelines. Animals were kept in 12 hr day and night cycle. Vaginal smears were taken daily and 50 female rats were evaluated microscopically for normal cycles for 10 days. Determination of ovarian cycle: vaginal smears were collected daily in the morning from 9.00 to 11.00 am for each animal and evaluated microscopically for oestrus cycle determination throughout study period. Normal saline (NaCl 0.9%), 0.1 ml was inserted gently in the vaginal opening of the female rats and sucked back through a sterile dropper. The vaginal fluid was placed on clean slide to make a smear. The slide was covered with a cover slip and one drop of liquid paraffin was added on the slide and the unstained material was observed under the microscope in 10x and 40x magnification. Cells with rounded shape and nucleated ones were epithelial cells, irregular ones without nucleus were the cornified cells and the little round ones were the leukocytes. The proportion of these cells in the slides was used for determination of different phases of estrous cycle. The study included 42 rats with regular cycles. They were divided into seven groups of six animals in each, Group-I served as control and received only vehicle once daily throughout the study. Rats from groups II – VII were treated with Letrozole (Femara® Manufactured by Cipla, India) at concentrations of 1.0 mg/kg p.o for 28 days. Development of PCOS was confirmed from cessation of oestrus cycles and biochemical parameters. Drug treatment was started from 29th day for next 28 days. Group – I was control group which received vehicle, Group – II was PCOS control with no treatment, Group – III was treated with Clomiphene citrate (1 mg/Kg), Group – IV was given NA (0.9 g/Kg), Group – V received Metfromin (Met) (150 mg/Kg), Group – VI received a combination of NA& Metfromin and Group – -VII was treated with Kañcanāra Guggulu (100 mg/Kg) orally for 28 days. Dose of NA and KañcanāraGugguluwas extrapolated from human dose. As per the model, Letrozole was given for 28 days. After 28 days, drug treatment was started to observe the changes in oestrous phase. Therefore, in the evaluation of PCOS, cycle regularization was one of the important parameters for assessing the efficacy of the test drugs. In humans, for regularization of menstrual cycles treatment is required for three to four months i. e. 3 – 4 cycles. In rats, one cycle is of five days. We designed the study to cover four cycles and so, treatment was given for 28 days. Leterozole treatment was stopped on day 28. Therefore to check whether the PCOS developed or not, readings on day 0 (Baseline) and day 28 were taken. Readings on 56th were taken to check the effect of the drug treatment. Blood samples were collected by retro-orbital puncture into different plain tubes on day 0, 28 and 56. The blood samples were centrifuged at 3000 rpm for 15 minutes and serum was separated for biochemical investigations. The plasma was stored in a freezer at –20 ± 2°C for further analysis. After blood sample collection on day 56, the animals were euthanized, ovaries and uteri were removed, cleaned of fat and weighed. Sections of the ovaries were cut from paraffin-embedded blocks. Histological examinations were carried out using haematoxylin-eosin staining using light microscopy. Phases of Estrous cycle were checked daily during whole study period. Body weight was recorded every day. Blood samples were collected on day 0, 28, 56. Blood glucose, Insulin, cholesterol, triglycerides and HDL levels were estimated in serum. Ovaries and uteri were weighed and subjected to histopathological studies. Statistical analysis was done with Graph pad Prism 6, ANOVA followed by Tukey's multiple comparisons test. Data were expressed as Mean ± SEM and a P value < 0.05 was considered as significant. In comparison to normal control (Group–I) there was significant (P < 0.01) increase in body weight of control-PCOS (Group – II). Treatment with NA (P < 0.01), Metformin (P < 0.01) individually and in combination showed significant (P < 0.001) reduction in body weight, in comparison to control PCOS on day 56. 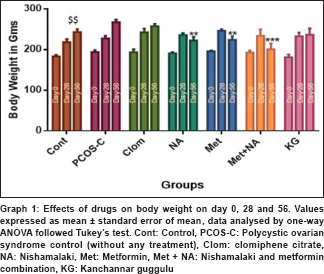 Clomiphene and KañcanāraGuggulu did not show significant effect on body weight [Graph 1]. In normal rats oestrus cycles are of 4–5 days which consists of Di-oestrus phase of 70 h, Proestrus phase of 12 h, Oestrus phase of 9-15 h and Met-estrus phase of 20 h. With Letrozole treatment for 28 days, cycles became irregular in all the groups. Oestrus phase was not seen. But with the drug treatment from day 29 to day 56, Estrus phase reappeared sequentially with Kañcanāra Guggulu group in the first week, in Clomiphene group and NA + Met combination group in the second week, NA alone and MET alone groups in the third week and cycles did not regularize even at the end of 4th week in control PCOS group [Figure 1]. 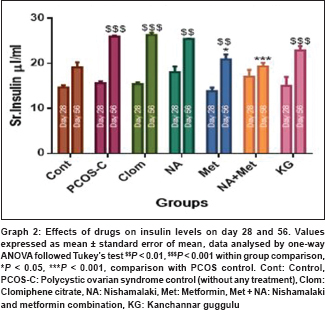 Within the individual groups comparison of insulin levels on 28 and 56 day was done, significant (P < 0.001) increase in insulin level was observed in PCOS-C, clomiphene and KG treated groups. Lesser but significant (P < 0.01) increase in insulin level was seen in NA and Met groups but increase was non-significant in NA + Met combination group. In intergroup comparison of 56th day insulin level, significant decrease in NA + Met combination (P < 0.001) and Met (P < 0.05) group was observed [Graph 2]. In comparison to control, significant (P < 0.001) increase was seen in blood glucose in PCOS-C, Clomiphene & KG groups. 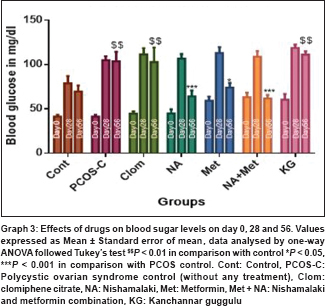 When compared to PCOS- C, there was significant (P < 0.05) decrease in blood sugar in metformin & (P < 0.001), in NA & & NA + Met combination (P < 0.001) groups [Graph 3]. PCOS-C rats had high cholesterol level (P < 0.001) and increased levels of triglycerides as compared to vehicle control. NA significantly reduced serum cholesterol (P < 0.05), triglycerides (P < 0.01) levels. Combination of NA & Metformin was equally effective to NA in reducing cholesterol and triglycerides. Improvement in HDL cholesterol level was also observed though it was not statistically significant. KG showed favorable changes like reduction in cholesterol and increase in HDL levels. Clomiphene did not show significant effect on lipid levels [Table 1]. 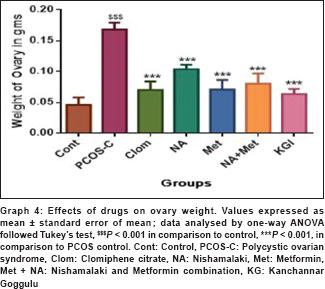 Ovary weight was significantly high (P < 0.001) in control-PCOS group as compared to normal control. Significant reduction (P < 0.001) in all remaining groups was observed as compared to control-PCOS. When intergroup comparison was done, clomiphene and KG group showed marked reduction in Ovary weight and the results of both these groups were comparable. This reduction was more than the NA and MET individual group as well as the combination group [Graph 4]. 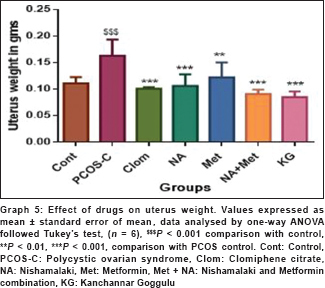 Uterus weight was significantly high (P < 0.001) in control-PCOS group in comparison to control. Significant reduction (P < 0.001) in all remaining groups was observed in comparison to control-PCOS. When intergroup comparison was done clomiphene and KG group showed marked reduction in Uterus weight and the results of both these groups were comparable. This reduction was more than the NA and MET individual group as well as the combination group [Graph 5]. Premature luteinization of theca cells. PCOS control group showed degenerative structures of follicles along with cysts. PCOS-control group showed multiple cysts with degenerative changes. In other groups, no significant histopathological abnormality was seen [Figure 2]. PCOS is the most common form of chronic anovulation associated with androgen excess. Initially, Stein and Leventhal had considered it to be ovarian in nature. But now with extensive work done on this condition, it is known to have pathology at multiple sites. One of the abnormalities in PCOS is insulin resistance that is present in both-lean as well as obese individuals. Insulin resistance is also present in patients of T2DM and metabolic syndrome. The basic pathology demonstrated in metabolic syndrome is resistance to insulin at muscle and adipose tissue level causing increase in free fatty acid levels and this leads to hyperlipidaemia and increased cardiovascular risk. Considerable similarity exists in the pathogenesis between metabolic syndrome and PCOS. Hyperlipidaemia and increased cardiovascular risk are also seen in PCOS. When all the abnormalities in PCOS are considered, insulin resistance emerges as the basic pathology. Studies investigating pathology in PCOS revealed that like insulin resistance of Type 2 DM, there is post receptor defect which leads to phosphorylation at serine residue instead of tyrosine residue. This defect is known to increase oxidative stress and atherosclerosis. The presence of insulin resistance in PCOS as in diabetes mellitus and with the efficacy of NA in prophylaxis of diabetes, this work was planned to evaluate the efficacy of NA in PCOS. Important clinical manifestations of PCOS are anovulation, changes in menstrual pattern, hyperandrogenemia and poly cystic ovaries. In animal studies, it is difficult to ascertain the manifestations of hyperandrogenemia but changes in menstrual cycle, insulin resistance, hyperlipidaemia and changes in ovary/uterus can be studied. Letrozole is an aromatase inhibitor which produces peripheral deficiency of estradiol and leads to the development of PCOS like condition with increase in body weight, blood glucose and insulin levels, dyslipidemia and changes in uterus/ovary. So, Letrozole induced PCOS model was used to study the efficacy of NA in this condition. We observed that the oestrous phase of the menstrual cycle was completely not seen with the use of letrozole. Therefore, along with the above parameters, regularization of menstrual cycles was also studied. Clinically, for insulin resistance of PCOS metformin is used. Which is supposed to correct all the manifestations of PCOS. For regularizing menstrual cycles, clomiphene citrate and Kañcanāra Guggulu are used in biomedicine and Ayurveda respectively. In our previous study, it was found that NA effectively reduced insulin resistance. So, NA was compared with Metformin. In addition, it was evaluated for correcting other abnormalities of PCOS such as dyslipidemia, uterine/ovarian weight and also for correcting menstrual irregularity such as clomiphene and KG. Effect on body weight was evaluated. On 28th day of letrozole treatment, body weight was increased in PCOS group in comparison to control. Significant reduction was seen in NA, Metformin and the combination (NA + MET) groups by 56th day. The combination was more effective among the test drugs [Graph 1]. Metformin has weight reducing action by reducing absorption of carbohydrates and also by its anorectic effect. Body weight reducing activity of NA, CL or EO is not reported. It is reported that PPARγ receptor agonists produce favorable redistribution of fat and reduces body weight. CL and EO are shown to have PPARγ activity. So, NA also might be reducing body weight by the same mechanism. Since NA and metformin work by different mechanisms in reducing body weight, their combination probably had additive effect. Lipid levels were increased on 28th day of letrozole treatment [Table 1]. Significant reduction in lipid levels was seen only in NA and the combination (NA + MET) groups. Clomiphene and metformin had no effect on lipid profile whereas non-significant reduction was produced by KG. Curcumin is shown to reduce cholesterol level by reducing its synthesis and also by increasing its catabolism. Curcumin is reported to interact with various signal transduction systems to reduce hyperlipidaemia. Lipid lowering activity of Amla is reported to be similar to that of simvastatin. Though there was non-significant reduction in lipid level with metformin, and the effect of the combination (NA and Metformin) was similar to that of NA, indicating no additional benefit of the combination on lipid profile. By 28th day, hyperglycaemia [Graph 3] was seen in all the letrozole treated groups but insulin level was comparable to that in control animals [Graph 2]. By day 56, in PCOS group, insulin level also increased but hyperglycemia continued. In response to rise in insulin, blood sugar level should have reduced but it remained high indicating that this was the insulin resistant state. Hyperglycemia and increase in insulin level was present in clomiphene and KG groups too. Significant blood sugar reduction was seen in NA and metformin groups, NA was more effective in this regard. Insulin levels reduced in both these groups, metformin was more effective than NA. This indicated reversal of insulin resistance with NA and metformin. NA's effect may be due to many mechanisms that reduce hyperglycemia. It may act by PPARγ receptor stimulation mainly on adipose tissue and muscle to reduce insulin resistance. Metformin on the other hand, reduces insulin resistance by working on liver through AMPK mechanism but insulin releasing action is not attributed to it. Higher insulin level with NA than metformin [Graph 2] might be because of insulin releasing action of NA and because of this action more blood sugar reduction probably was seen in NA group. Adipose tissue, muscle and liver are the three important sites of insulin resistance. NA works on adipose tissue and muscle while Metformin acts on liver. When used in combination, probably, these actions complement each other and maximum reduction in insulin and glucose level was obtained indicating significant reduction in insulin resistance. In all drug treated groups, significant reduction in weight of ovary and uterus was seen, though the effect was maximum with KG followed by clomiphene. This indicates that KG and clomiphene corrected specific pathology pertaining to these organs. In PCOS, constant but low level of FSH stimulates the follicular growth continuously, though they do not reach maturation. Life span of follicles is increased and multiple small cysts is the characteristic of PCOS. Ovulation inducers like clomiphene and KG increase FSH level and produce maturation of the follicle and ovulation. Early correction of ovarian pathology by clomiphene and KG probably was responsible for rapid reduction of weight of ovary in particular. All the developing ovarian follicles eventually start degenerating with loss of granulosa cells. But theca cells continue to be present and along with ovarian stromal cells are responsible for the production of androstenedione. Androstenedione gets converted to testosterone and estradiol in the peripheral tissues. In uterus, estradiol is formed causing proliferation of endometrium and increase in weight of the uterus. When ovarian pathology gets corrected and the number of follicles reduce, circulating androstenedione and local estradiol in the uterus would reduce. This mechanism probably was responsible for the reduction in the weight of uterus. Though reduction in uterine weight was seen in all the drug treated groups, effect was marginally more in KG and the combination group [Graph 5]. In normal rats oestrus cycles are of 4-5 days which consists of Di-oestrus phase of 70 h, Proestrus phase of 12 h, Oestrus phase of 9-15 h and Met-estrus phase of 20 h. With Letrozole treatment for 28 days, cycles became irregular in all the groups. Oestrus phase was not seen. But with the drug treatment from day 29 to day 56, the specific action of clomiphene and KG on ovary was probably responsible for early regularization of menstrual cycles. KG worked better in this regard and regularized the cycles in the very first week, whereas clomiphene could do so in the second week. NA and metformin are not reported to have any specific effect on the ovary, but in combination they regularized the cycles in the second week and individual agents in the third week. Correction of menstrual cycles by NA and metformin probably followed the correction of insulin resistance. In PCOS control group degenerative structures of follicles along with cyst were present. But in other groups, all the changes were reverted by the end of the study and no significant histopathological abnormality was seen. Niśāmalakī and Metformin individually corrected insulin resistance and corrected all the parameters studied such as body weight, oestrus cycle and lipid profile, NA was more effective. Combination was more effective than individual agents on body weight and on oestrus cycles. NA was more effective than metformin on lipid profile and the combination had no added advantage. NA corrected all dyslipidaemic changes produced by letrozole. KG and clomiphene rapidly normalized the cycles but had little effect on biochemical parameters. FSH, LH and androgen estimation was not done. We thank Dr. Pallawi Khatavkar, Dr. Eesha Angadi, Dr. Amit Gupta and Dr. Priyanka Pathak from Departments of Pharmacology for their help during execution of the project. Amoura M, Lotfy ZH, Neveen ER, Khloud A. Potential effects of Mentha piperita (peppermint) on letrozole-induced polycystic ovarian syndrome in female albino rat. Int J Adv Res 2015;3:211-26. Dasgupta S, Reddy BM. Present status of understanding on the genetic etiology of polycystic ovary syndrome. J Postgrad Med 2008;54:115-25. Diamanti-Kandarakis E, Piperi C, Spina J, Argyrakopoulou G, Papanastasiou L, Bergiele A, et al. Polycystic ovary syndrome: The influence of environmental and genetic factors. Hormones (Athens) 2006;5:17-34. Vaidya Shubhada Velankar. Ayurvediya Shtree Vidnyana. Dadar, Mumbai: Granthali Publishers; 2010. Synder PJ. Androgens. In: Goodman & Gilman, the Pharmacological Basis of Therapeutics. 12th ed., Ch. 41. New York: McGraw Hill Publication; 2017. p. 1204-6. Dawane J, Pandit VA, Deshpande SS, Kuvalekar AA, Mandpe A, Wele A, et al. Evaluation of anti-diabetic activity of Nishamlaki on streptozotocin induced type II diabetic rats. Int J Phytomed 2015;6:595-600. Kalekar SA, Munshi RP, Bhalerao SS, Thatte UM. Insulin sensitizing effect of 3 Indian medicinal plants: An in vitro study. Indian J Pharmacol 2013;45:30. Dhiman K. Ayurvedic intervention in the management of uterine fibroids: A case series. Ayu 2014;35:303-8. Mishra R, Sharma S, Sharma RS, Singh S, Sardesai MM, Sharma S, et al. Viscum articulatum burm. F. aqueous extract exerts antiproliferative effect and induces cell cycle arrest and apoptosis in leukemia cells. J Ethnopharmacol 2018;219:91-102. Pandit RK, Suresh K. Kanchnar guggulu – A critical review. J Res Educ Indian Med 1992;11:39-42. Legro RS, Barnhart HX, Schlaff WD, Carr BR, Diamond MP, Carson SA, et al. Clomiphene, metformin, or both for infertility in the polycystic ovary syndrome. N Engl J Med 2007;356:551-66. Kirtikar KR, Basu BD. Indian Medicinal Plants. 2nd ed., Vol. 4. Dehradun: International Book Distributors; 1998. p. 2738-9. Evans HM, Long JA. Characteristic effects upon growth, oestrus and ovulation induced by the intraperitoneal administration of fresh anterior hypophyseal substance. Proc Natl Acad Sci U S A 1922;8:38-9. 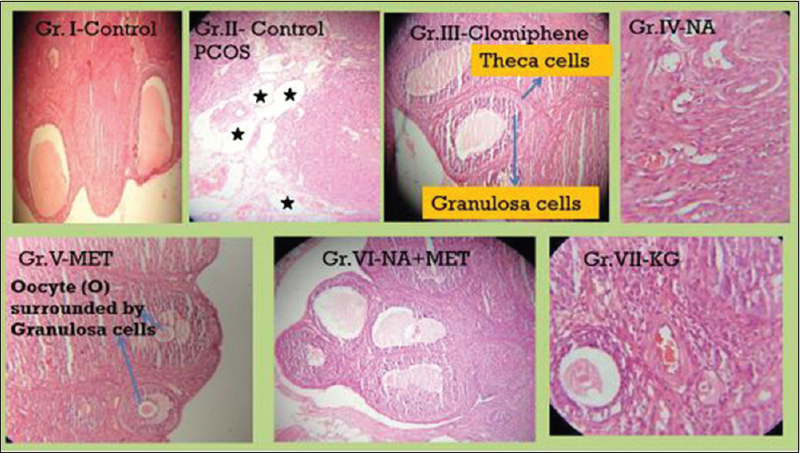 Sasikala SL, Shamila S. Unique rat model exhibiting biochemical fluctuations of letrozole induced polycystic ovary syndrome and subsequent treatment with allopathic and ayurvedic medicines. J Cell Tissue Res 2009;9:2013-7. Cussons AJ, Stuckey BG, Watts GF. Metabolic syndrome and cardiometabolic risk in PCOS. Curr Diab Rep 2007;7:66-73. Reaven GM, Lithell H, Landsberg L. Hypertension and associated metabolic abnormalities – the role of insulin resistance and the sympathoadrenal system. N Engl J Med 1996;334:374-81. Verma S, Mather K, Dumont AS, Anderson TJ. Pharmacological modulation of insulin resistance and hyperinsulinemia in polycystic ovary syndrome: The emerging role. Endocrinologist 1998;8:418-24. Maliqueo M, Benrick A, Stener-Victorin E. Rodent models of polycystic ovary syndrome: Phenotypic presentation, pathophysiology, and the effects of different interventions. Semin Reprod Med 2014;32:183-93. Tripathi KD. Essentials of Medical Pharmacology. Insulin, Oral Hypoglycaemic Drugs and Glucagon. 7th ed. New Delhi: Jaypee Brothers Medical Publishers (P) Ltd.; 2013. p. 278-9. Nagashima K, Lopez C, Donovan D, Ngai C, Fontanez N, Bensadoun A, et al. Effects of the PPARgamma agonist pioglitazone on lipoprotein metabolism in patients with type 2 diabetes mellitus. J Clin Invest 2005;115:1323-32. Soni KB, Kuttan R. Effect of oral curcumin administration on serum peroxides and cholesterol levels in human volunteers. Indian J Physiol Pharmacol 1992;36:273-5. Suresh Babu P, Srinivasan K. Amelioration of renal lesions associated with diabetes by dietary curcumin in streptozotocin diabetic rats. Mol Cell Biochem 1998;181:87-96. Shehzad A, Ha T, Subhan F, Lee YS. New mechanisms and the anti-inflammatory role of curcumin in obesity and obesity-related metabolic diseases. Eur J Nutr 2011;50:151-61. Gopa B, Bhatt J, Hemavathi KG. A comparative clinical study of hypolipidemic efficacy of amla (Emblica officinalis) with 3-hydroxy-3-methylglutaryl-coenzyme-A reductase inhibitor simvastatin. Indian J Pharmacol 2012;44:238-42. Olefsky JM. Treatment of insulin resistance with peroxisome proliferator-activated receptor gamma agonists. J Clin Invest 2000;106:467-72. Rani R, Mishra S. Phytochemistry of guggul (Commiphora wightii): A review. Asian J Res Chem 2013;6:415-26. Chappel SC, Howles C. Reevaluation of the roles of luteinizing hormone and follicle-stimulating hormone in the ovulatory process. Hum Reprod 1991;6:1206-12.